So know that this won't do well in a free study but I like it, think that it is good for my first try. Know that I want to go back and take more so that I can get better at this. Here is the orginial, I really didn't do much processing just cropped it and some fine tweaking. Stupidly underrated this is fantastic! Awesome job Rosemary! This is so pretty - I was trying to think of the words "oil painting" when I wrote my comment. I can see something like this on a canvas. Congrats on your new PB! Congrats on your new #1!! Hello from the Critique Club. First off, I love this shot, I find it to be very calming. I am at odds over the two birds in here, when I crop it to just the top bird, it looks great, but something is missing, then the two of them together looks just as good. I would be interested to see what it would look like in this size with the lower bird not in it at all. Your background is such a dreamy colour, the greens compliment the breast orange so well. The motion of the wings are perfect, if it has been caught in situ this shot would not have had such impact. I think just a tweak of straightening would have leveled the lower bird and it would not have affected the top bird and the placement wouldn't feel just a tiny bit off. Really beautiful capture, Rosemary, I hope you do keep trying for more "harmonic convergences" like this one. This should have done much better, imo. I love the colors, and I agree with MaryO--there's a dreamlike quality about it! Very pretty. It looks almost like a painting. Beautiful colors! I love the way the 2nd one is pretty much in the background. Very sharp details exactly where you want them. I love the DoF on this shot. Very cool indeed, I bumped the score up on my second view, its a great shot. 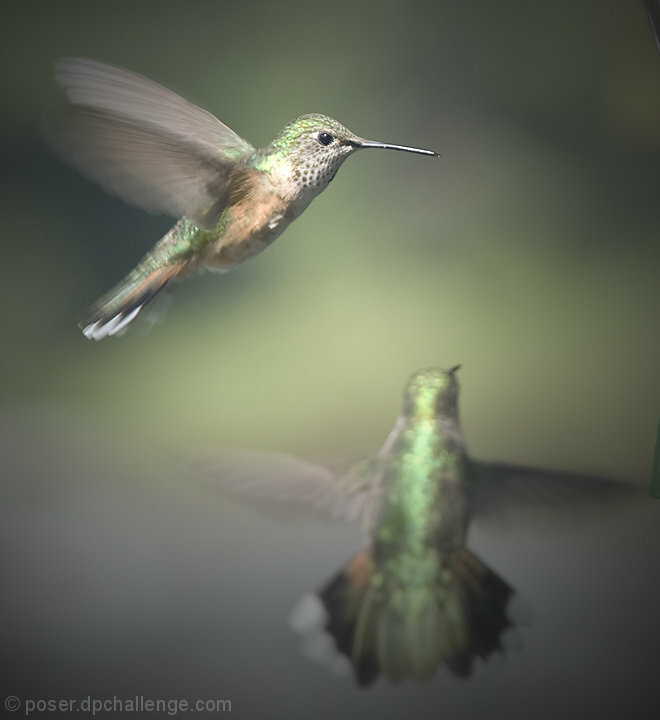 Most don't realize how hard it is to photograph hummingbirds... Well done. I feel rather ambiguous about this image - it has a lot going for it in terms of overall impact - technically, it's about as good as you can do with fauna like this and the colors are nicely done - there's just a feeling of being "incomplete" if you will - I can't put my finger on why and this is the third time I've looked at it. And it has a certain esthetic that is pleasing to the eye - I just wish I could peg it for sure. In any case, well done. Proudly hosted by Sargasso Networks. Current Server Time: 04/24/2019 09:50:09 PM EDT.